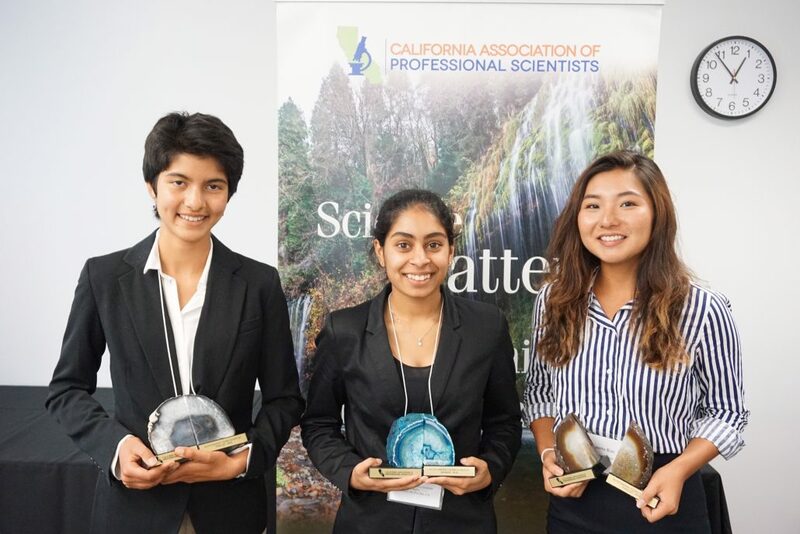 CAPS Outstanding Young Scientist (center) Nina Patel, and runners-up Amaya Bechler (left), and Chloe Kim. It has been a longstanding goal of CAPS to promote scientific education to the young scientists of tomorrow. On September 14, 2018, CAPS hosted its annual Outstanding Young Scientists Luncheon. This year, Nina Patel, a young scientist from Carmel High School was crowned the Outstanding Young Scientist of 2018. Families, CAPS Staff, and Board of Directors members were thoroughly impressed by her research on Toxoplasma gondii and its effects on humans. The young scientist took home a check for $1,000 and a pair of custom-made CAPS engraved geode bookends. Our two other semi-finalists. Amaya Bechler and Chloe Kim, each took home a check for $500 and custom-made CAPS engraved geode bookends. See the attached picture. The Outstanding Young Scientist competition begins annually in the summer with the awards ceremony in the fall. The competitors are those students who have been selected to receive the regional CAPS Science Achievement Award. Three finalists are selected by the CAPS Public Relations Committee after a detailed review of each project. The finalists will be invited to attend the Outstanding Young Scientist Awards Luncheon in Sacramento in the fall. Each finalist may be accompanied by his/her parent(s) or chaperone(s) and travel expenses are covered by CAPS. Finalists and semi-finalists all receive an award and monetary scholarship.